Australia Journ. Bot. 13: 332. 1956. Cap 1.5-4 cm broad, convex, broadly so in age, the disc sometimes slightly depressed to umbilicate; margin incurved at first, finely striate when moist, occasionally uplifted at maturity; surface hygrophanous, smooth to innately fibrillose, reddish-brown fading to buff-brown, sometimes with a darker marginal band; flesh thin, colored like the moist cap; odor faintly fungal; taste mild. Gills adnate to subdecurrent, moderately broad with alternating lamellulae, intervenose, pinkish to flesh-colored. Stipe 1.5-5 cm tall, 2-5 mm thick, fragile, hollow, cartilaginous, round, sometimes flattened; equal to tapering to a slightly enlarged base; surface pallid to white fibrillose over a vinaceous-brown background, more coarsely fibrillose in age the fibrils then buff-brown, matted white mycelium at the base; flesh dull vinaceous-brown, unchanging; veil absent. Spores 8-10.5 x 7.5-9 µm, subglobose to broadly elliptical, spinose, nonamyloid; spore print white. Scattered to gregarious under Eucalyptus, Acacia and other ornamental trees; fruiting from mid to late winter. 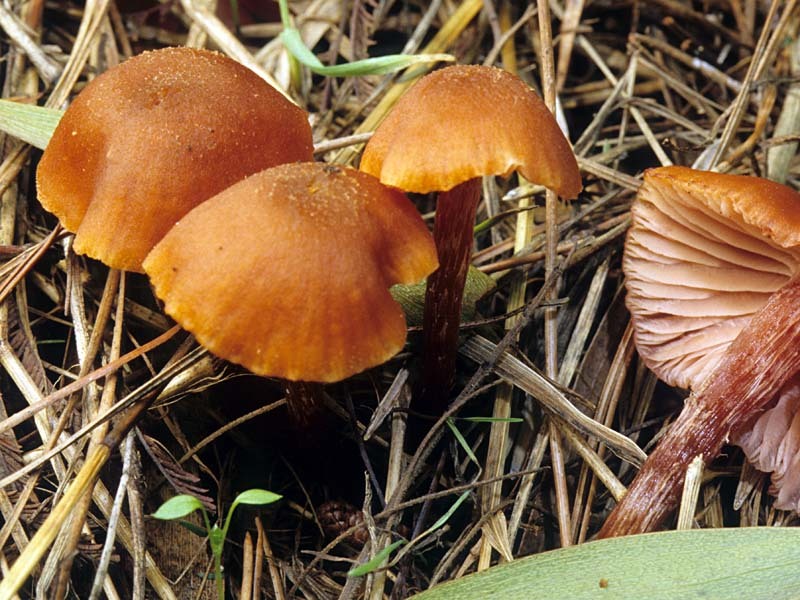 Laccaria fraterna is characterized by a reddish-brown cap with a finely striate margin which soon fades to buff-brown, flesh-pink gills, and a fibrillose stipe with matted, white mycelium at the base. 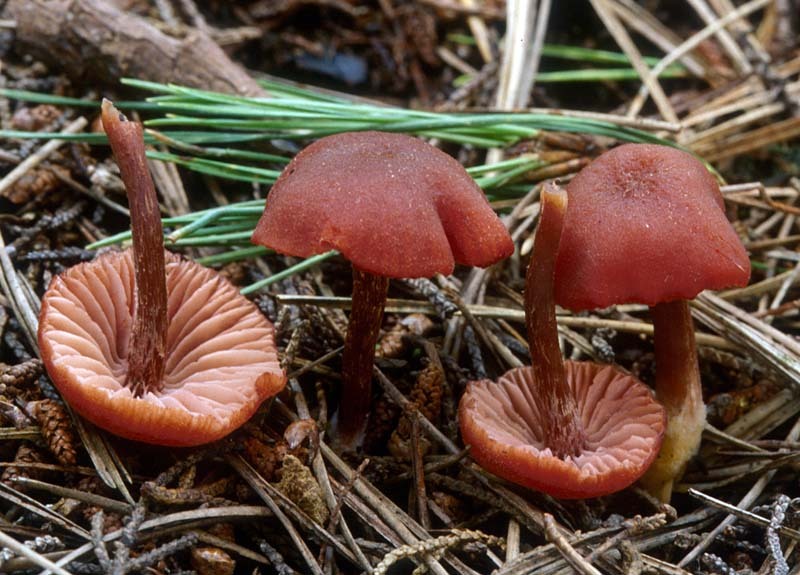 According to Mueller, Laccaria fraterna is believed to be an introduced species and is associated with ornamental trees like Eucalyptus. 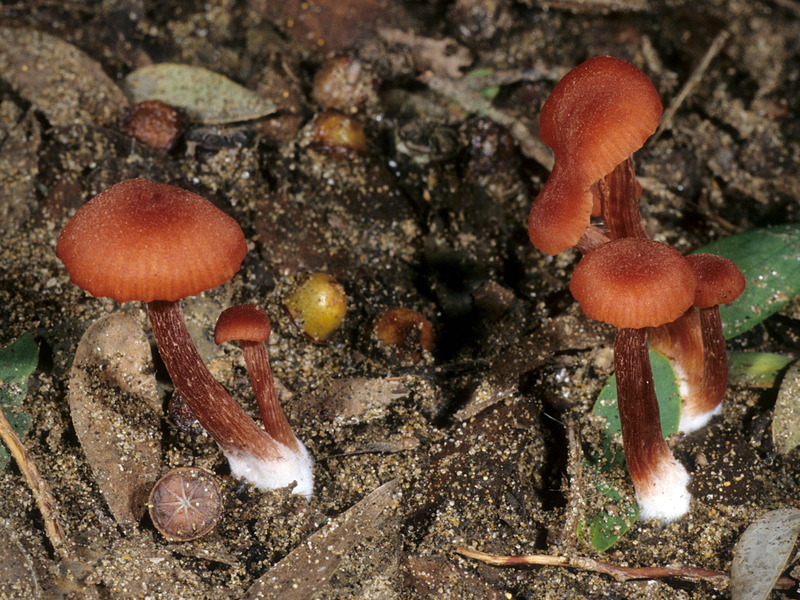 Microscopically, Laccaria fraterna is one of only three species of Laccaria that are two-spored. For many years this mushroom was known locally as Laccaria laccata but that species is 4-spored and of the two varieties of Laccaria laccata, only L. laccata var. pallidifolia is common. Bas, C., Kyper, T.W., Noordeloos, M.E. & Vellinga, E.C. (1995). Flora Agaricina Neerlandica -- Critical monographs on the families of agarics and boleti occuring in the Netherlands. Volume 3. Tricholomataceae. A. A. Balkema: Rotterdam, Netherlands. 183 p.
Bougher, N.L. & Syme, K. (1998). Fungi of Southern Australia. University of Western Australia Press: Nedlands, Australia. 391 p.
Mueller, G.M. (1992). 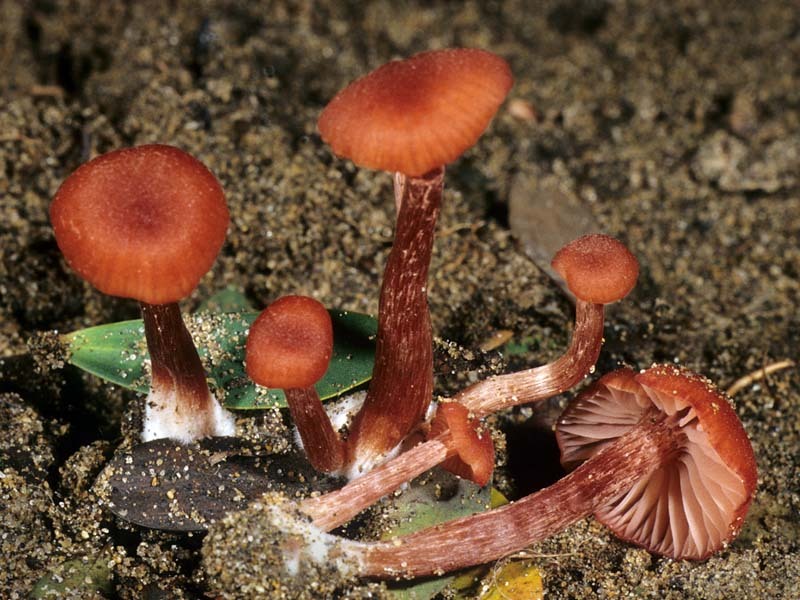 Systematics of Laccaria (Agaricales) in the Continental United States and Canada, with Discussions on Extralimital Taxa and Descriptions of Extant Taxa. Field Museum of Natural History: Chicago, IL. 192 p.